At issue from the neighbors opposing the development were concerns over the precedent being set by C-2-B zoning, which grants 65 feet of height by right, and up to 90 feet in Planned Unit Development. Flyers handed out by ANC 5A07 Carolyn Steptoe were suggesting that this would allow any developer to ask, and be granted, 90-foot buildings in Brookland’s residential neighborhoods without opposition. Most of the residents within 200 feet of the project felt that the development’s 61 feet were too high for the neighborhood, and all who live within that distance spoke in opposition to the project, citing both concern over the height of the development and a lack of an open dialogue with the developing group. One of the 200-footers in an impassioned plea said that she “could not afford to move” from her house behind the development, but an increase in density would make it impossible for her to park near her home. The development group, anchored by Horning Brothers and the Menkiti Group, but also including the proprietor of Colonel Brooks Jim Steigman, had many supporters from both business groups and residents in the neighborhood. 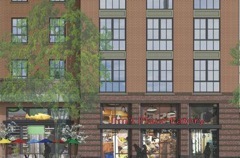 There was significant approval for the design, done by DC-favorite Esocoff & Associates from neighbors and business members alike, as well as the prospect of additional amenities for the neighborhood, and additional residents designed to help bolster foot traffic for businesses on the Monroe/12th Street axis. Do you know which house the “impassioned plea” woman lives in? I just drove by there tonight and all the houses on that 10th Street block have off-street parking. And I’m not sure how one reconciles her argument that she won’t be able to afford to move from that house with the likely increase in her house’s value once it doesn’t have a tavern parking lot and dumpster behind it.